UK contractor Keltbray Group has opened a new hub in east London, which will allow it to extend its lifting services to external clients. Keltbray first established its lifting capability in 2010 to support the group’s many functions, and its demolition services in particular. In line with the growth of the company’s services, including remediation, sheet piling and reinforced concrete structures, the lifting services have continued to expand its capability. With a team of experienced lifting engineers now in place and with £1m worth of investment in specialist lifting equipment from a dedicated base in Silvertown in east London, for easy access to all major developments across the capital, Keltbray Lifting Services is now able to offer this expertise as external consultants and contract lift providers. The company has already completed work for a handful of external clients, including maintenance and restoration specialists De-Pest, where the contract involved removal of a historic bridge at St. Katharine Docks in order that the bridge could be refurbished off site. 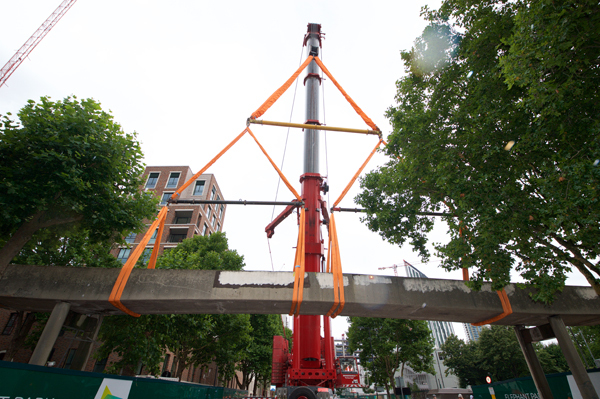 Due to access constraints, Keltbray carried out the lifting operations using a barge-mounted crane; delivering the project ahead of time and on budget. Keltbray has a track record for operating in highly regulated environments, and the lifting service is no different. The company has developed its expertise over a number of years by carrying out complex projects for its internal businesses at major developments, such as Earls Court, Battersea Power Station and London Bridge, and is now offering this capability as a stand-alone service, or as an integrated part of other Keltbray services to optimise cost benefits for clients.